This post is written by Sandi Combs , Marketing Coordinator for Experience Columbus. The first time I learned of Zoombezi Bay was when I was visiting the Columbus Zoo & Aquarium with family two summers ago. We took one look at the towering slides of the water park we never knew existed and said “we’ve got to go there!” A year later, a group of friends and I finally made the trip there, and we loved it! We ended up staying until the park closed at 9 to make sure we got one last go on each of the attractions before making the two-hour drive home. 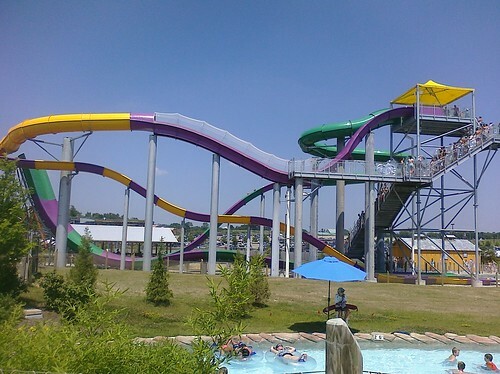 Now that I’m a full-fledged resident of Columbus, of course one of the first things on my summer fun to-do list was to go back to Zoombezi Bay. Lured by my memories of last summer and the park’s two new water slides, my boyfriend and I headed out this past Sunday armed with our sunscreen, beach towels and swimsuits to make the most of the July heat by cooling off at our favorite water attraction. So, here’s the scoop on the park: Zoombezi Bay features 17 water slides, an action river, a lazy river, a wave pool, two kiddie play areas, plenty of lounge chairs for sun bathing and much, much more. It is a very popular place and you’ll find all kinds of people there, from thrill-seeking young adults to families to everyone in-between. The two new slides, Big Boa Falls and Python Plunge are great. Python Plunge shoots you through a winding tunnel at high speeds before sending you down a hill to the splash pool, while Big Boa Falls blasts you up a hill, giving you the rush of feeling weightless, and then shoots you back down to the landing pool. It kind of feels like you’re riding a waterslide uphill. Both are experienced via rafts. Here’s a picture of the slides. Do note that lines for some of the most popular attractions, like the action river and the Cyclone slide, will be long during peak periods of the day (from about noon-4 p.m.), especially on weekends; my advice is to hit those toward the beginning or end of your visit so you can do more during the hours you are there. Also, the sidewalks can get toasty if it’s a super-hot day, so if you or anyone in your group has sensitive feet, I’d recommend wearing water shoes or keeping flip-flops on until you’re at the next activity on your list. Zoombezi Bay offers a couple other amenities to enhance your visit. The first is that your admission ticket also gets you into the Columbus Zoo & Aquarium, which is great. We usually do the zoo in the morning, and then as it gets warmer, we head over to the water park. Zoombezi Bay also offers private cabanas that you can rent out for the day. 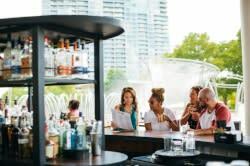 If you have a large group, renting one of those makes life much easier because you get a private wait staff to take your food and beverage orders, a special discounted menu, plus a convenient place to park all of your stuff. Zoombezi Bay’s Facebook page has a nice collection of photos that will help you get a feel for what the park is like.